What do the terms “assessed value,” “state equalized value” and “taxable value” on my Notice of Assessment mean? ● Assessed value—The assessed value is determined by a property’s market value. Set by the assessor, the assessed value when multiplied by two will give an approximate market value of the property. The assessor is constitutionally required to set the assessed value at 50% of the usual selling price or true cash value of the property. ● State Equalized Value (SEV)—SEV is the assessed value that has been adjusted following county and state equalization. The County Board of Commissioners and the Michigan State Tax Commission must review local assessments and adjust (equalize) them if they are above or below the constitutional 50% level of assessment. ● Taxable value—A property’s taxable value is the value used for determining the property owner’s tax liability. Multiplying the taxable value by the local millage rate will determine your tax liability. Taxable value increases from year to year by the rate of inflation or 5%, whichever is lower. Transfers of ownership and improvements to the property will increase the taxable value more than the rate of inflation but never more than the assessed value. How does the assessor determine the assessed value of my property? To ensure properties are assessed uniformly and at 50% of market value, the assessor uses the results of the equalization study that is provided by the Eaton County Equalization Department. This study is an analysis of the sales price of the property compared to its SEV for each class of property; residential, commercial, industrial, or agricultural. If there are not a sufficient number of sales for a particular class then the SEV will be compared to the appraised value that is done by the county appraisal staff. Typically, the sales study runs from October 1st through September 30th for residential. This study may also be a 2 years study at the discretion of the County and State. The same study period applies to the appraisal study although this most likely will be a 2 years study given the lack of sales in the commercial and industrial classes. The sales/appraisals are then organized by economic neighborhoods by the assessor. An economic neighborhood can be a single subdivision or a grouping of subdivisions with similar characteristics, or group of similar type properties. If the sales/appraisals in a certain economic neighborhood indicate an increase or decrease then all of the properties in that economic neighborhood will be changed by what the sales/appraisals have indicated. This ensures all properties are assessed at 50% of market value as of December 31. Summer property taxes are due in the Treasurer’s Office by 4 p.m. on August 31st. Winter property taxes are due in the Treasurer’s Office by 4 p.m. on February 14th. There is a 24-hour drop box located behind City Hall at the corner of Washington and Harris. Does the City accept credit/debit cards for payment? Yes. During tax season — July 1 through February 28 — you can pay with credit and debit cards online and at the payment counter in City Hall. A convenience fee is added to the payment amount at the time the transaction occurs. Information about the fee is available here. The Treasurer’s office can provide you with a copy of your paid tax bill. 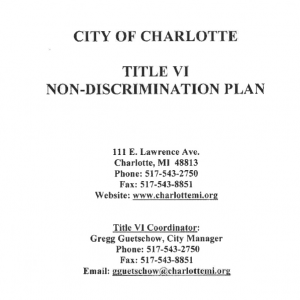 You can also access this information on the city’s website at www.charlottemi.org; select assessing and tax services. You can access your property by owner’s name, address or parcel number. The site has tax information back to 2001. Clicking on the “+” sign next to the year/season will show the detailed information for that tax season. In this view, you will also have the option of printing the tax bill/receipt by clicking on the “Print Tax Bill/Receipt” blue icon in the bottom left corner of the screen. How does the assessor determine my Assessed Value? To ensure properties are assessed uniformly and at 50% of market value, the assessor uses a two year sales study that is provided by the Eaton County Equalization Department. A sales study is an analysis of the sales price of the property compared to its SEV. Typically, the sales study runs from April 1st to March 31st. The sales are then organized by economic neighborhoods by the assessor. An economic neighborhood can be a single subdivision or a grouping of subdivisions with similar characteristics. If the sales in a certain economic neighborhood indicate an increase or decrease then all of the properties in that economic neighborhood will be changed by what the sales have indicated. This ensures all properties are assessed at 50% of market value as of December 31st. What determines the Taxable Value? On March 15, 1994 Michigan voters approved the constitutional amendment known as Proposal A. The Taxable Value was created as a part of this legislation. Taxable Value, or the figure which millage would be multiplied against, can only increase each year by the rate of inflation or 5%, whichever is lower. The Taxable Value on the property is said to be “Capped” if the property owner has not had any additions or losses on the property or did not purchase it in the preceding year. The legislators who wrote and put Proposal A on the ballot intended to put a cap on the value of the property so that taxpayers wouldn’t be as affected by a robust housing market and a significant increase in valuation. The intention was to tie the increase in valuation to the inflation rate so that it would be more affordable for residents and would benefit those residents who intended to remain at their properties for longer periods of time. Property values in my neighborhood have been decreasing. Will my property valuation be decreasing as well? Unfortunately, there isn’t a yes or no answer to that question. If you’ve owned your property for a significant amount of time, more than likely your State Equalized Value (SEV) far exceeds your Taxable Value. If this is the case, a decrease in valuation, caused by a cooling real estate market, will be reflected in the SEV. The Taxable Value is required by the Michigan Constitution to increase each year by the rate of inflation or 5%, whichever is lower. In the case of a longtime property owner, the SEV could decrease, while the Taxable Value will increase. Does that mean I’ll pay more property taxes instead of less?